Xi Jinping envisions Egypt as a hub for China’s Belt and Road initiative. That “practical cooperation” is centered around Xi’s signature initiatives, the Silk Road Economic Belt and 21st Century Maritime Silk Road (collectively known as the “Belt and Road”). The Belt and Road initiative, unveiled by Xi in the fall of 2013, calls for a trade and infrastructure network linking China with Europe, over land on the “Belt” and via sea on the “Road” (you can view a map of the general routes here). 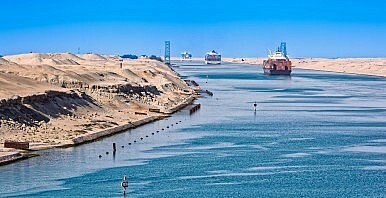 Egypt is a particularly crucial part of the Maritime Silk Road, with the Suez Canal functioning as the main transit point between the Indian Ocean and the Mediterranean Sea. That makes Egypt one of the few indispensable partners for the Belt and Road — simply put, the route as currently envisioned cannot exist without Egypt’s participation. While speaking with Egyptian President Abdel Fattah al-Sisi, Xi suggested that China and Egypt should work together to make Egypt a “pivot” or “hub” for the Belt and Road. As in other countries, that will largely involve Chinese cooperation on infrastructure projects, with additional investment in industrialization in the host country. Sisi and Xi signed a memorandum of understanding agreeing to work together on the Belt and Road, reaffirming previous statements made by the two leaders. As an added sweetener, China also announced that it will provide $1 billion in financing for Egypt’s central bank, and another $700 million in loans to the National Bank of Egypt. China’s special envoy to the Middle East, Gong Xiaosheng, told Xinhua in an interview that China believes the Belt and Road can bring peace and social stability to the Middle East. He also noted that the rapid growth of economic ties between China and Middle Eastern countries “shows that China’s influence is increasing as the country can provide them with a new possibility and choice.” The new choice offered by China is tacitly understood as an alternative to the ‘old choice’ of reliance on the United States. In his remarks in Egypt, Xi pointed out that China supports the right of individual countries to select their own development path, and also supports their efforts to maintain “social stability.” That’s an implicit dig at the United States, Egypt’s major security partner, which watched Sisi’s 2013 military coup and resulting rights crackdown with some dismay. China’s alternative is clear: a partner who will remain silent on Egypt’s internal affairs, while bolstering Sisi’s ambitious projects with much-needed investment. In fact, Xi explicitly encouraged Chinese companies to participate in Egypt’s major projects, including developing the Suez Canal Corridor and building a new administrative capital outside of Cairo. China and Egypt have already taken steps to cooperate on those projects. On his first visit to China, in December 2014, Sisi said he would actively court Chinese investment for the New Suez Canal project. Last September, when Sisi visited China to attend its military parade commemorating the 70th anniversary of the end of World War II, China State Construction Engineering Corporation agreed to build and finance part of the $45 billion project to build government agencies and offices in the new administrative capital. Highlighting the benefits for Egypt in increased economic cooperation with China, Xi said in a speech that the planned expansion of the China-Egypt Suez Economic and Trade Cooperation Zone would create more than 10,000 jobs for Egypt. According to the Chinese company in charge of the construction, the expansion project will take 10 years to complete and involve a total investment of $230 million. The benefit for China is that any project it undertakes in Egypt now will be tied to the Belt and Road, and seen as a victory for the Chinese initiative. Imagine the New Suez Canal, completed with Chinese financing and managed by a Chinese company as the gateway between Europe and Asia – Xi’s already dreaming just that. How Old Is China’s Belt and Road Initiative Exactly?China's Balancing Act in IranChina, Egypt Consolidate Ties After Sisi's Attendance at Military ParadeChina's Egypt OpportunityWhat Is China's Objective With the 2018 16+1 Summit?